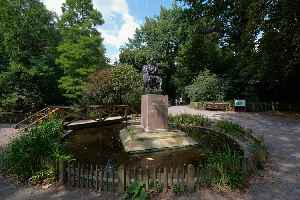 Holland Park is an area of Kensington, on the western edge of Central London, that contains a street and public park of the same name. It has no official boundaries but is roughly bounded by Kensington High Street to the south, Holland Road to the west, Holland Park Avenue to the north, and Kensington Church Street to the east. Adjacent districts are Notting Hill to the north, Earl's Court to the south, and Shepherd's Bush to the northwest.